As the Denver Nuggets arrived in Boston, Massachusetts for their matchup with the Celtics, the weight of the environment was immense. First, and most importantly, a win in Boston would secure a playoff berth for the first time since 2012-13 for the Nuggets. Everything Denver had working towards had the potential to be realized in the TD Garden on Monday night. Secondly, Denver’s road matchup with the Celtics was going to be the first time Isaiah Thomas returned to Boston while being healthy and active. There are few players as beloved by the Celtics fan base as Thomas is. His return was emotional and loomed large. Third, there was some bad blood between the Nuggets and the Celtics after Jamal Murray unnecessarily took a 3-point jump shot at the end of a game that was already decided. Murray was shooting to get to the 50-point mark for the first time in his career. He missed the jump shot and, after Kyrie Irving got his hands on the game ball, he threw it deep into the stands for the sole reason of keeping the game ball from getting back to Murray, who finished with a career-high 48 points against Irving and the Celtics. With all of that hovering over the Nuggets road matchup with the Celtics, Denver had their work cut out for them. Despite Boston’s best effort, the resilient Nuggets refused to fold as they came away with their 47th win of the season with a 114-105 win over the Celtics. Their win secured a playoff spot for the first time since the 2012-13 season as well. The Nuggets began the game missing open shots, but generating great looks on each and every offensive possession. Those great looks finally started resulting in points as Denver went on a 13-0 run in the first quarter which propelled them to a 24-22 lead after the first 12 minutes. While the play on the court was the most important aspect of the first quarter, there was a much more human moment that carried a lot of weight. At the first timeout, the Celtics played a tribute video thanking Isaiah Thomas for his time in Boston which was followed up with a minute long standing ovation for Thomas. During the ovation, Thomas was visibly emotional because of the amount of love that the Celtics fans showed to him during his return. In addition to Thomas’ ovation after the video tribute, there was a second standing ovation when Thomas checked in to play in Boston for the first time since being traded. Thomas’ six-minute stint was not extremely productive, but it was a fantastic moment for the city of Boston and Thomas. In the second quarter, the Nuggets continued their struggles shooting from beyond the 3-point line. They had numerous open opportunities from deep, but could not connect. Still, despite shooting just 5-18 from 3-point range, Denver had 55 first-half points and still shot just over 45 percent from the field. Their real saving grace in the first half was their stingy defense. Denver was flying around and selling out in order to put together a strong two quarters of defensive play. The Celtics only managed to shoot a measly 39.6 percent and that is including nine second-chance points thanks to seven offensive rebounds by Boston, who finished with 52 points at halftime. Things got clunky for the Nuggets in the third quarter. 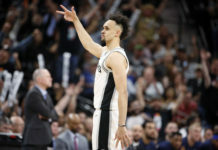 Denver’s offense was unable to create great looks at the same level as they were in the first half and their defensive communication began to struggle which allowed the Celtics to convert their first four shots — three layups and a 3-pointer — of the third quarter. The biggest issue for Denver’s offense in the third quarter, was their inability to get the ball to Nikola Jokic. All three of Gary Harris, Will Barton, and Jamal Murray failed to get the ball to Jokic when he had an advantage at multiple points in the frame and it completely bogged down Denver’s offense. Then, to make matters worse, Denver had seven turnovers in the third quarter which was two more than Denver had in the entire first half. Additionally, Irving found his footing as a scorer in the third quarter. He had 11 points in 12 minutes on seven shots and had two assists and two steals for good measure. Irving was getting into the paint at will and it opened up the Celtics offense. As it started to look like Denver was losing their grip on the game, Torrey Craig emerged. With just 1.1 seconds left before the end of the third quarter, Craig hit a big 3-pointer to bring Denver back within two points. Then, after a turnover on the inbounds pass by the Celtics, the Nuggets had the ball back with 1.1 seconds. That was all the time Craig needed to get an uncontested dunk and tie the game at 80 points a piece as the third quarter came to and end. 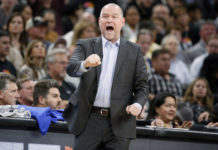 Craig’s energy was massive for Denver in a tightly contested game on the road against the Celtics team that had won five of six games prior to taking on the Nuggets. In the fourth quarter, the urgency level spiked. Everyone on each team could feel the magnitude of the game and it transformed what was a somewhat clunky game into a competitive gauntlet of death. 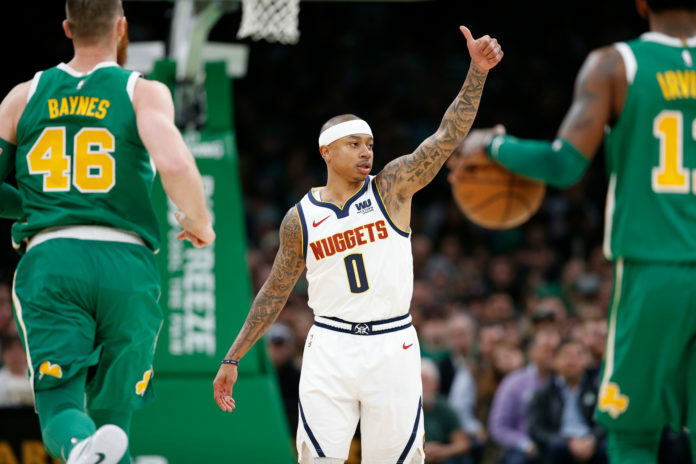 As the battle continued to rage between the Nuggets and Celtics in the fourth quarter, it was the Nuggets that were slowly but surely extending their lead. Jokic hit a pair of 3-pointers which were followed up by a triple from Gary Harris to push Denver’s lead as high as 10 points with just four minutes left in the game. That was the beginning of the end for the Celtics. They continued to fight, but after Millsap completed a four-point play with under a minute left to play, there was not enough time for the Celtics to complete their comeback. Denver managed to came away with 17th road win of the season after a 114-105 victory in Boston. 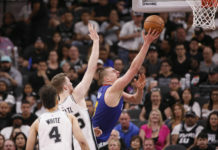 By the time the final buzzer sounded, Jokic led the Nugget with 21 points, 13 rebounds, and seven assists to go with two steals and two blocks as well. Barton was also strong and had 20 points, four rebounds, and two assists. Off the bench, Craig was relentless as he finished with 13 points and eight rebounds to go with his regular infectious energy. Next, the Nuggets will continue their east coast road trip in Washington D.C. against the Wizards. That game will take place on Thursday 5 PM MST.